I know it's a good thing for pet rescue in general, and also for my shelter HotRescues, to get publicity since it calls people's attention to matters involving saving animals and encourages them to help needy pets. That's why I don't object to having my adventures memorialized in books and novellas. And it's also why I didn't object to having a book trailer made about the most recent full-length book about me, OODLES OF POODLES. 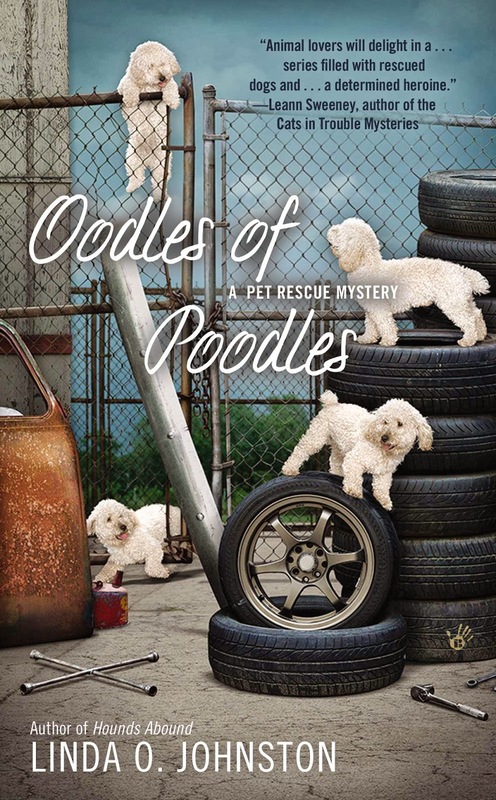 OODLES OF POODLES involves the film industry, so it's an appropriate story to be promoted in a film of sorts. A lot of people I know--including me--are depicted in it by actors briefly appearing as if they're the real thing. The best part of it, in my opinion, is the real poodles in it. The story is about Sheba's Story, a film being made about rescued poodles that stars rescued poodles. Plus, it doesn't hurt that the narration tells about what happened to the director of the film when he began ignoring the safety measures he'd agreed to for ensuring that none of the real poodles were hurt. He was murdered, killed in a hit-and-run. I of course don't condone murder, but I also hate the idea of endangering animals. And since a good friend of mine, veterinarian Dr. Carlie Stellan, became the chief suspect, I had to get involved to figure out who the real murderer was. Be sure to let me know if you enjoy it. It's fun to see what the characters look like! Those actors aren't identical to us, but they're close. I loved those dogs in the video. It makes me want a pet. I love the poodles, too, and they're excellent representations of the dogs in Oodles of Poodles!